6 different Santa's Toy Shop designs, as pictured, printed onto quality smooth 300gsm cream card. Each tag is supplied with a length of organza ribbon. 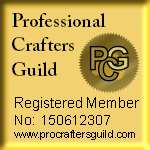 Ideal for card making, scrapbooking, as gift tags or other craft projects.